Sammy just unveiled its second-gen model dubbed the Galaxy Note 10.1 (2014 Edition) just in time for the coming Halloween and Christmas holidays. The Samsung Galaxy Note 10.1-2014 edition is quite a tablet. Featured with a 10.1-inch WQXGA (2560X1600 pixels) Super clear LCD display, the Galaxy Note 10.1 (2014) tablet displays a higher resolution and more pixels per inch, even better than the new iPad Air (1920x1080 pixels) and Microsoft Surface 2 (1920x1080 pixels) which becomes an attractive point for movie lovers. Not a surprise that the new Galaxy Note 10.1 (2014 Edition) does not recognize Blu-ray movies as well, and you need to convert Blu-ray to Galaxy Note 10.1 (2014 Edition) playable MP4 format in advance. 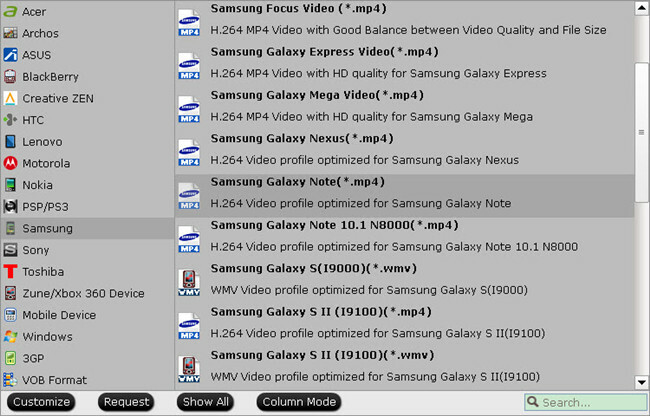 How to rip Blu-ray for playback on new Galaxy Note 10.1 (2014 Edition)? Step 1: Download, install and launch the best Blu-ray to Galaxy Note 10.1 2014 Edition converter. Step 2: Load Blu-ray movie. Click the “Load disc” button to import source disc from disc drive to Pavtube Blu-ray Ripper. 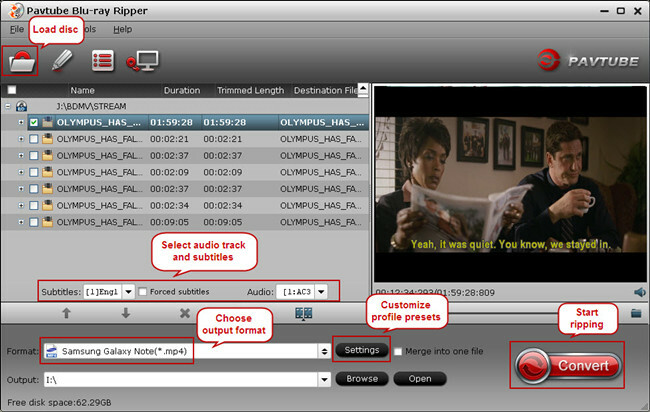 Tip 1: Don't forget to set one audio track and subtitles for output. If you’d like to save only forced subtitles, remember to select “Forced subtitles” box on program UI. Search for the optimized profile for your portable device from the “Format” drop-down list. You are suggested to select “Samsung > Samsung Galaxy Note (*.mp4)” for output. 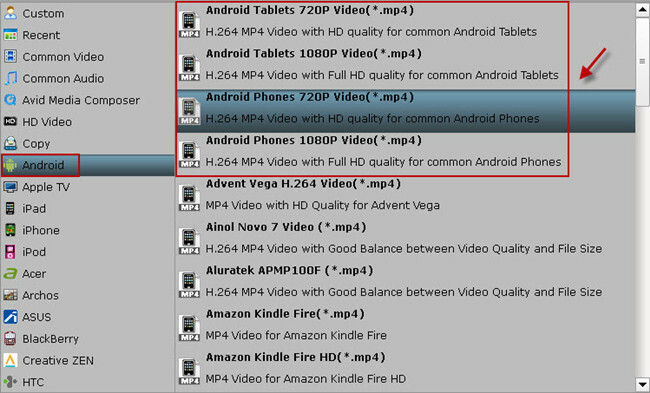 Tip 2: When you cannot find the particular profile for your device from Pavtube Blu-ray Ripper, don’t worry, it includes several general presets which are compatible for most Android phones and tablets. And you could enter “Settings” tab to adjust video display resolution, bitrate, frame rate, etc to meet the requirement of your Galaxy Note 10.1 2014 Edition tablet. Step 5: Start ripping Blu-ray to Galaxy Note 10.1 2014 Edition. Hit the “Convert” icon and start ripping Blu-ray to Samsung Galaxy Note 10.1 2014 Edition. After it finishes, you would get a created MP4 file in output destination. Now you are ready to transfer your Blu-ray movies to Galaxy Note 10.1 2014 Edition and enjoy your Blu-ray collections there.